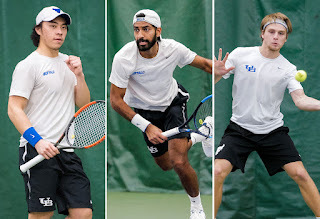 BUFFALO, N.Y. -- The University at Buffalo men's tennis team swept the final Mid-American Conference Player of the Week awards on Wednesday as sophomore Hao Sheng Koay was named the singles player of the week and seniors Vidit Vaghela and Petr Vodak were named doubles team of the week. Koay had a perfect week for the Bulls at first singles as he won a pair of road matches to wrap up the regular season. On Friday, he overcame a first set loss to defeat Kristopher Ortega, 2-6, 7-5, 7-6 in Dekalb. He then clinched the match against Ball State with a straight set win over Marko Guzina as he defeated him 7-6 (6), 6-4. Koay is 10-5 at first singles and 15-13 overall. In doubles action, Vaghela and Vodak won both of their matches at No. 1 doubles this past week on the road as UB clinched the No. 2 seed in the MAC Tournament. On Friday, they dropped just one game in a 6-1 victory over Eric Marbach and Kristopher Ortega over Northern Illinois. They followed that up on Sunday in the regular season finale with a 6-3 win over Nemanja Guzine and Collin Regney of Ball State. Vaghela and Vodak are 11-4 at first doubles this year and 14-4 overall. This is the fourth time this season that Vodak and Vaghela have been named doubles team of the week, while Koay has been named singles player of the week for the second time. The Bulls will open up Mid-American Conference Tournament play at home on Friday, as Buffalo will be the #2 seed in the tournament, playing #3 Northern Illinois at 2pm at the Miller Tennis Center. The early match will begin at 10am between #1 Western Michigan and #4 Northern Illinois.